1. The BEST PRICES in The Galaxy (Texas). 2. You get to pick your box from The BEST CASES in The Hobby. 3. Enter our contests for OVER $800.00. 4. TWO FREE Panini Black Friday FAT PACKS with your purchase of 2014-15 Paramount Basketball. 5. FREE Upper Deck Hockey Bonus Pack with your purchase of any 2014-15 UD Hockey Product. 6. Free top loaders for your autographs & jersey cards when you open your purchases in our store. 7. Meet and Trade with the BEST Collectors in The Hobby (our customers) any time, any day. Our LEAF Q boxes are LOADED. Every box opened in our store has been a WINNER! Next LEAF Q Group Box Break is TUESDAY at 6:00 p.m. Every $67.95 SPOT gets you ONE Random Card from a factory sealed box. Call Charlie at 210-524-2337 from 11 a.m. to 6:00 p.m. to pay for your spot. Pictures above are four typical box breaks at Sports Cards Plus. 2014 National Treasures Baseball Group Box Break is TUESDAY at 6:00 p.m. Every $59.95 Spot gets you ONE Random Card from a factory sealed box. If the box has 9 cards, the FIRST SPOT gets the first card and the last card! 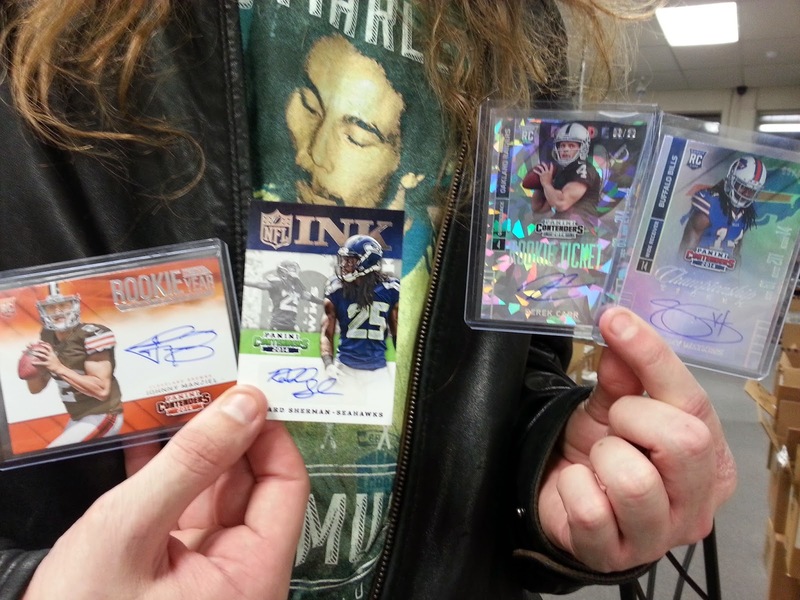 Pictured above are some hits from one case at Sports Cards Plus. The hottest product this week is 2014 CONTENDERS FOOTBALL. As always, our cases are amazing. 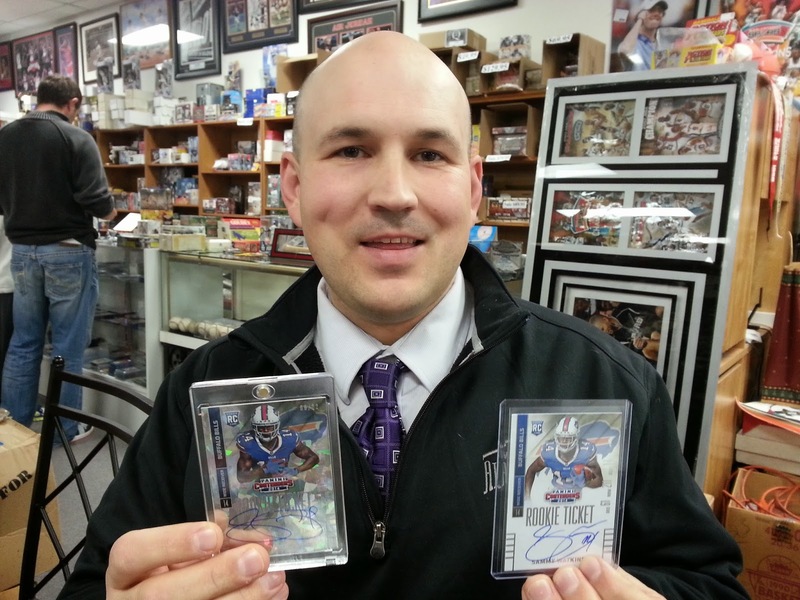 We have had 8 Sammy Watkins Auto RCs pulled, 4 Odell Beckham, 3 Teddy Bridgewater, 2 Mike Evans, and a Johnny Manziel. Our cases are loaded with numbered parallel Autographed RCs. We have had tons of Cracked Ice Autos #d/22 with one box having TWO Cracked Ice. 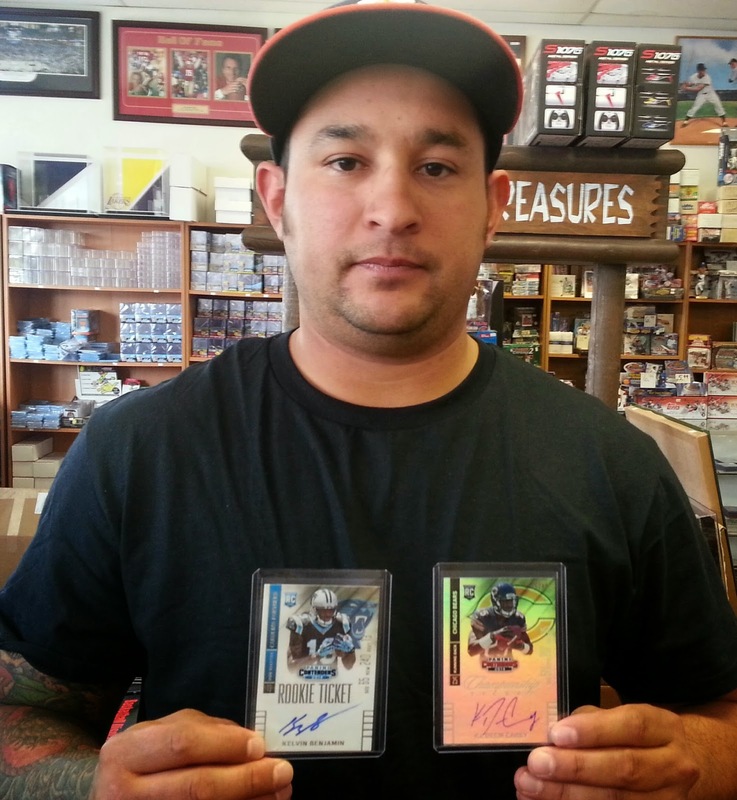 DON'T FORGET - BEST PULL from our initial shipment of 2014 Contenders Football WINS $100.00 at Sports Cards Plus! Don't be the guy who says, "That could have been my picture." Go to Sports Cards Plus TODAY and have some fun! Leland knows a good deal when he sees it. 2014 Contenders Football are ONLY $130.00 at Sports Cards Plus, a.k.a. The Super Hit Factory. Do like Leland. Go to Sports Cards Plus TODAY. Pull your favorite Super Hit and enter our CONTESTS FOR over $800.00 at Sports Cards Plus. The word is spreading. The BEST CASES and The LOWEST PRICES are at Sports Cards Plus. Rick and his son drove from Austin Texas to take advantage of our LOW, LOW, LOW PRICES and to get in on our LEAF Q GROUP BOX BREAK. Rick is holding a LEAF Q David Robinson Autographed NBA Game Worn Shoe Card. 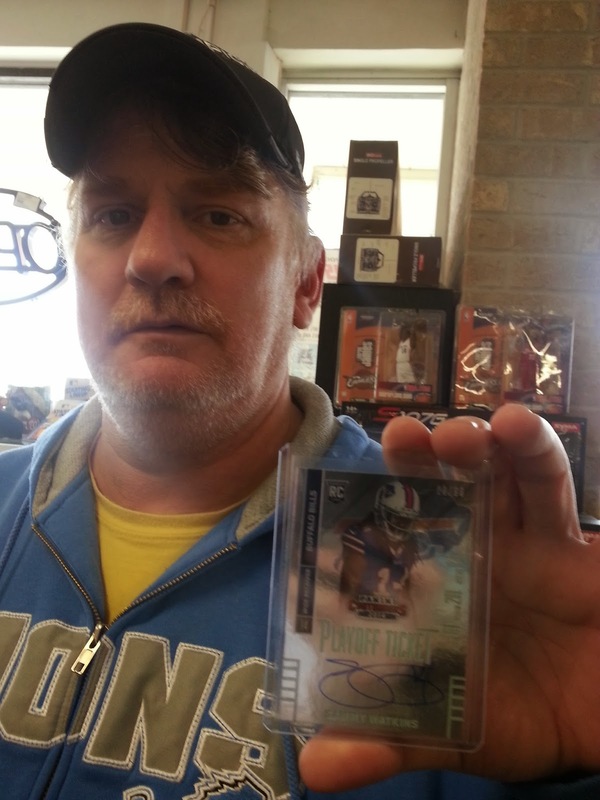 His son bought a box of 2014 Topps Valor ($54.95 per box) and pulled this TRIPLE Auto of Sammy Watkins, E J Manuel and C J Spiller. "People" are saying, "Its too hard to pull a big hit from 2014 Topps Valor Football." But at Sports Cards Plus, you can forget the odds. Ask Adam. 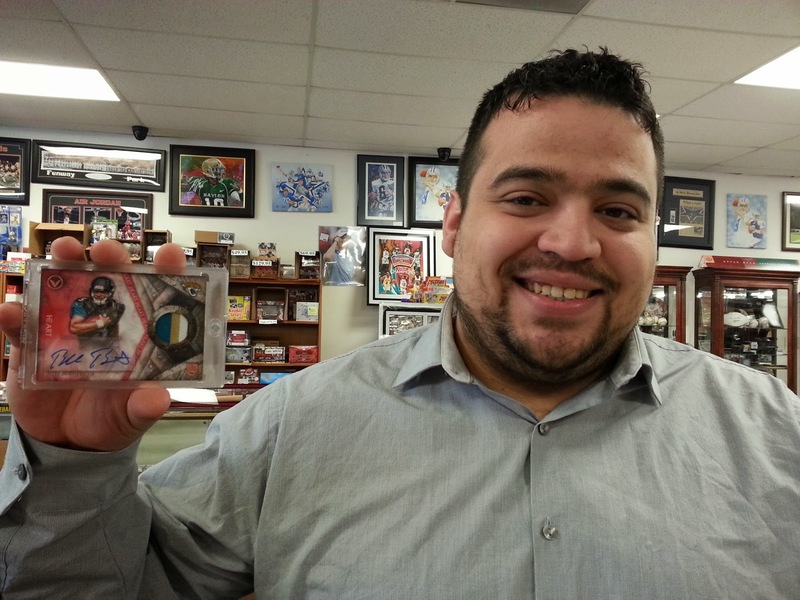 Here is Adam with his 2014 Topps Valor Blake Bortles Auto 4-Color Heart Jersey Patch RC 1/1. Its YOUR TURN to pull a Super Hit. Go to Sports Cards Plus TODAY!